This self-guided walking tour is designed to help you see some of the River Valley’s hidden history. Just follow the tour instructions in bold in the text below. You may not realize as you look at the beautiful river valley parkland, that this space used to be the industrial cradle of Strathcona and Edmonton. There were coal mines, factories, and workshops, workers houses and lots of industrial products and the waste and debris from creating them left behind. Its been cleaned up now and put to other uses, but sometimes, if you keep your eyes open, you can see evidence of our industrial past. EA-10-1451 Walter’s Mill and Yard Stacks of lumber processed by the mill to the right, to the left (the tall poles) is the conveyor belt that brought the logs up from the river. Start your walking tour at the John Walter Museum. The museum is the first example of industry in the River Valley. But before Walter was here with his ferry, the river crossing was enough to bring other people here – it’s one place where the banks are low and the distance across the river is short. Find a spot (east of the houses) where you can look across the river to Rossdale. This crossing enticed aboriginal people here for hundreds and thousands of years before European and American traders and settlers arrived here. Camps on either side of the river were sites of habitation, food gathering and preparation, tool making and social interaction. 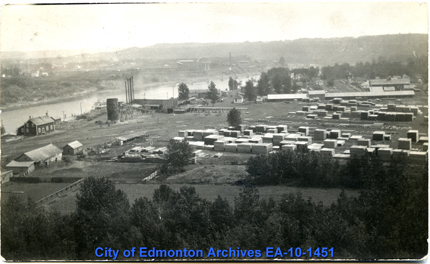 At least one early Fort Edmonton was built on the flats on the north side before the final fort was moved in 1832 up to the hill by where the Legislature was built in 1915. EA-10-71 Fort Edmonton in 1879. This photograph, taken by George Dawson, a surveyor, is of the Fort after it moved above the flood plain. The white house is Richard Hardisty’s, Chief Factor. It sat slightly southeast of the present Legislature. The remains of the Epcor power plant across the river show an industrial site which has been existence here since 1904. The remaining building with the tall smokestacks, named for its architect, Maxwell Dewar, was built between 1930 and 1954. Alex Taylor started the Edmonton Electric Lighting and Power Company in 1891 on the south side as a private venture, in what is now part of the Queen Elizabeth Park. It was flooded out in 1899 and rebuilding took a great deal more effort than the private investors expected. They sold to the newly established City of Edmonton who moved the plant to the north side. When Queen Elizabeth Park opens again after the new Walterdale Bridge is constructed you may be able to explore those ruins as well. Turn west however, to explore the Walterdale area instead – now known as KinPark. 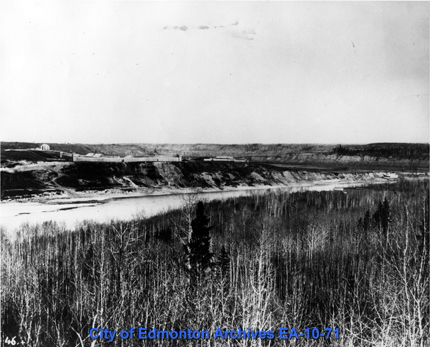 In 1953 the Kinsmen were granted a ten year lease to develop recreational areas on the flats. A combination of sweat equity and fundraising saw the development of playing fields and play grounds, a fitness park, a pitch and putt golf course, and several competition level sports facilities. 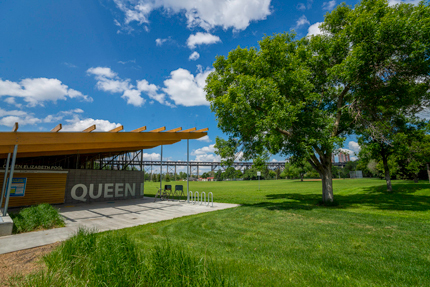 In 2013 the Queen Elizabeth Outdoor Pool was moved into the park as well and a splash park added for the entertainment of younger Edmontonians. Continue westward beside the road towards the LRT bridge (named for City Engineer, Dudley Menzies). There is the Husky Football Club’s building here and the grandstand for watching games. The High Level Bridge is a modern engineering marvel – built by the Dominion Bridge Company between 1910 and 1913. You can cross underneath the High Level Bridge on the walking trail and study the 32 piers and pedestals which made up the largest construction project of its age. The piers were 1.8 meters square at the base and rose 42 metres high to hold over 8,000 tonnes of steel girders stretching across 755 meters to reach between the banks of the North Saskatchewan. It has two decks – the upper for railway and streetcar tracks and one for pedestrians, bicycles and motor vehicles. The Dudley Menzies Bridge was constructed for the LRT in 1990 and allows access across the river to the Victoria Golf Course and park if you want an even longer walk. Keep going west on the north bank and you will reach the Government Hill Park under the grounds of Government House and the Provincial Museum of Alberta. This in turn links to the McKinnon Ravine and the trails that lead even further west and south west – all the way to the Valley Zoo or Fort Edmonton Park and beyond. On the south side of the river, however, you can continue to the area between and beyond the High Level and the Menzies Bridges. The area here was the site of the Bedard family’s Strathcona Tannery until they were put out of business by the 1915 flood. Their nearest neighbours were John and Frank Pollard who ran a brickyard. 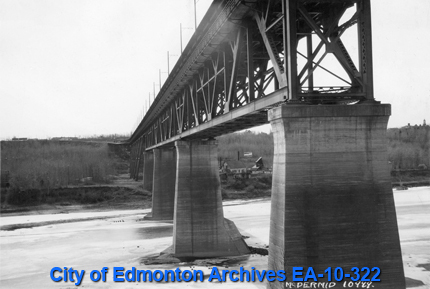 EA-10-322 High Level Bridge This image, taken on the north bank of the North Saskatchewan River, shows the Pollard’s Brickyard between the two pillars. Both Bedard (from Quebec) and John Pollard (from Iowa) came to Edmonton on their way to the gold fields before 1898. Both tried gold panning in the North Saskatchewan River and stayed here, rather than head further north. More steady employment was offered on the Walterdale flats and they stayed to make their living here. Both purchased their land from Laurent Garneau – who owned River Lot 7 which stretched from the river up the hill to the site of the University of Alberta. Remains of the brickyard can be seen along the running trails under the bridges and slightly to the west – including depressions where the cellar of their houses were dug into the soft clay, bricked in wells, trash deposits and chimneys and kilns from the brickworks. On the way back towards the Kinsmen Sports Centre you can follow the running trails closer to the river bank, stop at the picnic tables or play in the playgrounds scattered throughout the site.